In the late 19th century, a young Ontario man named James Naismith sat down to do what so many young people of a certain age still do every year: decide where to go to college. Naismith was very religious, a Presbyterian, and he thought long and hard about going to seminary. Ultimately, however, he chose to pursue a degree in Physical Education at McGill University in Montreal. The reasoning? He felt he could reach more young hearts for the Lord through sports than with anything else. The rest is history: needing an indoor activity to occupy the winter months at the YMCA he later worked at, Naismith invented basketball. His vision for the sport: “To win men for the Master through the gym,” Naismith was quoted as saying. It’s probably safe to say that Naismith’s creation is still going strong more than 100 years later: a 2012 study by the Sporting Goods Manufacturers Association (SGMA) concluded that over 26 million Americans play basketball in some format. Rodger Oswald, who founded the sports evangelism ministry Church Sports International, once estimated that 98% of Americans watch, read about, or participate in sports at least once a month. Aside from maybe food and music, there is no bigger cultural influence in our society today. Yet even as American involvement in sports reaches new heights, church attendance plummets. ChristianNewsWire.com reported that 8 million people are leaving the church each year – 150,000 a week. Those numbers are sobering, but in conjunction with the statistics about our sports consumption they represent an amazing opportunity – an opportunity for the church to use a game or a ball to connect with our communities, build trusted relationships, and earn the right to share the gospel of Jesus Christ with our players, parents, and coaches. In and of themselves, sports are a terrific arena for personal growth; athletic experience can help foster teamwork, sportsmanship, and individual accountability, among many other attributes. Sports teach the importance of respect, of understanding rules and boundaries, and of the reality of consequences for our actions and mistakes. Critical character traits such as sacrifice, mental toughness, and perseverance can all be cultivated on the field of athletic competition. Beyond even all of those positive developments is a platform for spiritual growth. Our mission statement here at Upward Sports is “promoting the discovery of Jesus through sports” – guiding, equipping, and partnering with churches and other Christian community leaders to build high-level sports programs that also create inroads towards sharing the gospel with nonbelievers and pointing them back to the church. 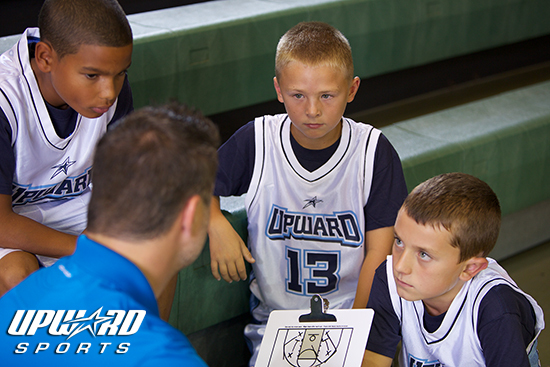 Over 40% of the participants in Upward Sports programs are unchurched; it has been a tremendous blessing to see so many new relationships built and so many lives changed by the gospel in our 18 years of ministry. Now more than a century after Naismith first threw a soccer ball through a peach basket on the wall, sports ministry is by no means a brand-new idea. Still, the trends that indicate a decline in Christian, churchgoing families suggest that perhaps an increased intentionality is necessary to help reconnect with our communities, and our young families in particular. Basketball was invented to fill a need: teenagers at a camp needed a healthy, weather-resistant activity that could nourish their minds, bodies, and souls. Fortunately for everyone involved in sports programming, those needs haven’t gone anywhere! Certainly there are plenty of reasons for that high number: the exposure of the professional sports machine turns our best athletes into accessible role models, for better or worse; many players and parents see sports as their best bet for a productive future, in the often cutthroat quest for a college scholarship; other families simply see sports as a healthy alternative – in every sense – to any of the myriad other extracurricular activities available to our kids today. Regardless of the motivation, there are so many footholds for the love of Christ to be spoken and acted into the lives of these young athletes! The more sports kids play, the more time they and their families spend at practices, games, and tournaments. The more sports kids play, the more influential their coaches become in their personal development. The more sports kids play, the fewer opportunities they have to be plugged into a church. Each of those circumstances is critical, because together they point to the collective impact and influence that sports can have on the lives and the growth of a young family. How encouraging it would be if we could raise up more Christian coaches who could speak into these players’ lives at practices, during games, and on road trips! How impactful it would be if we the church could pray over, equip, and celebrate the families who are practicing intentional ministry to their teammates’ and teammates’ families even when they’re not at church! However you approach your ministry, know that sports can be an ideal platform for evangelism; if you run first-class, organized, and detailed sports programs, you can build trusted relationships with players and parents, and earn the greatest right of all: the right to share the good news of Jesus Christ. When it comes to sports, don’t just play – play with purpose.